Favorite toy: Soft squeeky rabbit. Favorite activity: Going for a walk. Walking on the beach. Killing snakes, chasing squirrels and sleeping. Special talents: I'm trying to run and jump high enough to catch the birds, but so far have not been air-born. Most embarrassing moment: My grandma was having a family reunion. My entrance was memorable: I ran into the room and whent potty on the back door curtains. My mom was so embarrassed. But to this day eveyone remembers me! Most trouble I ever got into: My brother, Casey and I ran away from home and visited the grade school down the street and it was lunch time. While Casey waited outside, I found the lunch room and picked up some great hand-outs at the salad bar. My favorite friends: My human brother Chris and my dog brother Casey - he's a golden retriever. My half-sister Angel. 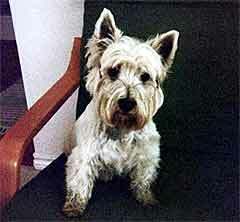 Biggest adventure: I walked in the Westie Walk last September. We walked through downtown Portland with over 100 westies!